Broadband Internet is required for these maps. Just click the thumbnail to view the map or the quick links. I have been redoing this route map using all the latest web developments and knowledge I've gained to make a greater detailed map than ever before. Large sections of the route have been or are being, converted to cycle paths and walkways and adopted by Sustrans. On my map I have traced the entire original route of the Derby Canal. Using the Satellite mapping function in Google Maps you can clearly see certain sections of the Derby Canal. I have also used Google Streetview in many locations along the route to identify Canal bridges and paths. Sometimes even though the Canal has gone, the bridge over it remains in place. Some markers have links to 360 degree views of the at location. Some of the markers I have placed in my map have small photographs in them, click on them to view a larger version. These photographs were taken by Flickr photographers. If YOU have any photographs of things along this route that I have not included then please get in touch so I can add them. IF you can help please join my Derby Canal Flickr Group. I have put a lot of time and effort into making sure my Derby Canal route path and markers are correctly positioned but in some areas I may be off slightly, please let me know if this is the case. In those areas where there was no clear route using the Satellite map I had to guess by using bridges either side for reference combined with some old maps of the route. I hope you find my Derby Canal Route map of interest, perhaps you will learn something from it that you did not know before. provided below that will take you straight to points of interest along the route such as Locks and bridges. Quick Links : Clicking one of these links will give you a zoomed in centered view of that location. Swarkestone Junction Derby Canal and Trent and Mersey Canal. Baltimore Bridge orignal site of. Boulton Lane Bridge site of. Bracken's Lane bridge site of. Harvey Road bridge site of. Borrowash Bottom Lock inc 360 views (restored). Sandiacre Lock junction with Erewash Canal. 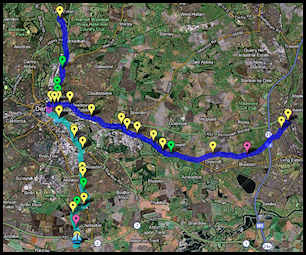 Click the thumbnail above to view my entire Derby Canal System map.